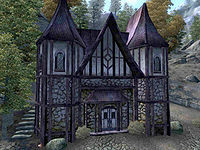 The servant's quarters is a small shack located to the east of the manor. After heading through the front door, you will find yourself in a lower-class building containing three beds and a few pieces of furniture. To your left, you will find two chairs and a table that holds a cheese wedge, a bread loaf, three tomatos inside a bowl, and a selection of lower-class dishes and silverware. A set of drawers containing clutter are located near this table, situated in the southwest corner of the building. North of the table is a small fireplace and one of the three beds inside the quarters. In between this bed and another bed to the east is a set of shelves that hold an assortment of lower-class dishes and a covered pot that may contain some food. In the northeast corner you will find the third bed and another set of shelves that hold three cheese wedges, two bread loaves, and three carrots. In between the shelves and a nearby fireplace is a grain sack and another sack that contains clutter. South of this fireplace is a chair with a sack containing clutter located behind it. Near this chair in the southeast corner of the building is a table that holds a cheese wedge, a covered pot that may contain some food, and some common books along with two accompanying chairs. Beside this table, near the door, is a set of drawers containing clutter with a pair of huntsman leather pants on top of them. Esta página foi modificada pela última vez à(s) 03h53min de 5 de setembro de 2014.